3,000 For $30 In 30 Days. The Rez Girls are back! The 2018-2019 roster is coming together. And they need new ice. The Rez Girls hockey team does not have a cement pad in their arena to practice on. We are raising funds to gift this team and northern community with a proper ice pad to practice, enjoy, and use for off-season events. If 3,000 people donated $30 each within the next 30 days it will provide enough funding and time to have the cement surface completed for the girls to use this season. 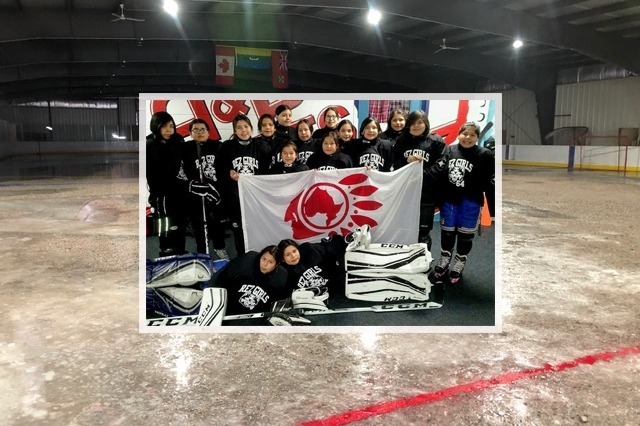 This past spring our family had the good fortune of getting to know an all-girl’s hockey team from Eabametoong First Nation (Fort Hope, ON), the JCY Rez Girls 64. Having only learned to skate the year prior and without proper equipment or facility, this team managed to raise $120,000 to attend the 35th Kanata Girls Hockey Association House League Tournament, and sight-see around Ottawa with their parents and coaches. During their tournament, we took professional and fun photos of the girls' games and events. The Rez Girls took Eastern Ontario by media storm, as people from near and far came to cheer them on. It was important for us to continue our new friendships, so we flew to Fort Hope one month later. We hand-delivered the girls’ portraits at a potluck, volunteered at the school and wandered around making new friends. Fort Hope is beautiful. But we learned that The Rez Girls hockey team does not have a cement pad to practice on. Instead, it is a large pebbled area in the arena that gets flooded, delaying the season’s start and ending the season early. The girls practiced all last winter on the lake and the arena’s questionable ice surface - each a disadvantage if they want to increase their skills and play at a higher level. The estimated cost of the cement, rebar and extras will near $90,000. Last spring the love and generosity that the Kingston community (and beyond) showed this hockey team was overwhelming. Would you overwhelm us again, by donating to our “3,000 for $30 in 30 Days” campaign that would allow for a First Nations all-girls team to enjoy some ice time? It’s Gord Downie’s birthday today. He would have been 55. Gord challenged us to look to the north and ‘do something’. Well, we all did, and it’s done! We will continue to forge ahead with (smaller!) focus projects in the community of Fort Hope. Many will be youth initiatives. You may not hear from us again as we will be shutting down this campaign very soon. Toronto Maple Leafs’ very own #16 Mitch Marner is graciously endorsing this campaign for a proper ice pad via his Marner Assist Foundation! Mr. Marner will match the first $5,000 raised. All donations will be issued tax receipts as his is a charitable fund. We are SO CLOSE to seeing this fundraiser come to an end, which is important because the cement must be purchased so it can be trucked to Fort Hope when the ice roads set in at the end of February. How can you help: please copy and paste the tweet from Mitch below with the link provided to your FB page and/or Twitter. This will be live until at least this Friday. We need your help with one more big social media push! Happy New Year Rez Girls Fans! There is a lot to update you on! The team has started practicing in the arena as the ice has frozen on the raised pebbles pad. The coaches and managers are busy planning their trip to Kingston and actively seeking corporate sponsorship to help fund their tournament costs. This year the cost will be $85k - yikes! Steve and I continue to network and relationship build with various individuals and organizations, sharing the Rez Girls 64 story and helping others to be a ‘good ally’. Currently, we have an awesome challenge between a few local schools who will raise money to help off-set the team’s costs. The winning school receives a curated collection of books written by Indigenous authors and a pizza party! The books have been graciously donated by 8 publishing companies and the value is around $700. Also. A couple of other amazing ‘big news’ announcements cannot be revealed just yet, but you’ll be the first to know! I encourage you to share our GFM page once again - it is imperative we meet our $90k goal within 4 weeks: ice roads to the community open in 4 weeks and this is when the cement will need to be shipped. We are grateful for your support and encouragement! ☀️Good Morning and Happy Holidays! I have it on good authority that the Rez Girls 64 Wolves hockey team will travel to KINGSTON, ON in March to participate in the Kids for Kids hockey tournament! Kingston has an opportunity to welcome these girls, families and coaches. Email me for ways to help out in the New Year.